Strike the perfect balance between the comfort of a chair and the health benefits of standing. 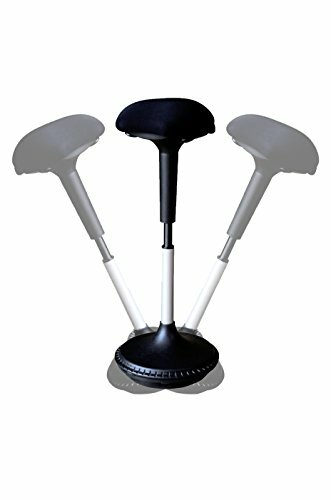 The Wobble Stool Active Sitting Chair / Ergonomic Standing Desk Swivel Stool with Adjustable Height keeps your core engaged and your legs in motion, while offering all-day support and relief for your feet, legs, and back. Not only are wobble stools fun, but they increase calorie burn and give your workday a boost in focus, creativity, and productivity. Features include an incredibly plush "perch" that is 13" wide and offers 3" of luxurious-yet-supportive padding. The wobble stool's 360 degrees of swivel lets you move with ease, while its adjustment range of 25-34.5" allows you to find the perfect height for any standing desk, conventional sit down desk, or sit down stand up desk. Our proven lever-activated pneumatic air cylinder is fast, easy-to-use, and whisper quiet. A clever, counterbalanced base offers stability while you lean, rock, and tilt at your desk. Other highlights include an easy, no-tools-required 4-step assembly and a non-skid, non-scratch, non-marking base to protect your floors. SIT to STAND: Enhance health, calorie burn, focus, creativity, and productivity throughout your workday. Simply add the active sitting chair to any standing desk, conventional desk, or sit down stand up desk to keep your core engaged and your body moving. STABLE: A thoughtfully-designed counterbalanced base with a non-skid surface lets you safely rock, tilt, and lean. The base is also non-marking and non-scratch to protect your floors. COMFORTABLE: An active sitting stool combines the support of a chair with the active movement of standing for the perfect balance. A generous 12" wide seat with a plush 3" of padding provides all-day comfort and support. EASY and SIMPLE: Smoothly adjust from sit to stand in seconds with a lever-activated pneumatic lift mechanism. Its height range of 25-34.5" lets you fine tune the perfect height for practically any sitting or standing desk. An effortless, 4-step assembly requires no tools and takes only a minute of your time. SITTING DISEASE DETERRENT: Numerous studies have shown that extended hours of sitting and inactivity, regardless of additional exercise, leads to a variety of ailments.. This quality active sitting chair gives you the ability to keep moving, as well as the flexibility of alternating between sitting and standing throughout the day.